Open 7 days a week till 4pm Boom Breakfast & Co is the place to be whenever you're craving something casual and comforting for breakfast, lunch or brunch. 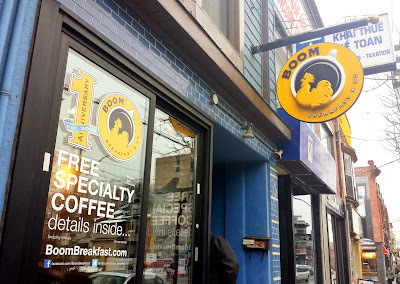 With four locations in Toronto and the GTA (808 College St., 1036 St. Clair W., 174 Eglinton Ave W. and 145 Hawkview Blvd in Vaughan) and a large and extensive menu, I'm confident that you'll find something you want at Boom. The restaurant offers a variety of traditional breakfast combos, omelettes, eggs benny, pancakes, French toasts, waffles, as well as sandwiches, breakwiches, breakfast burritos, wraps, and burgers. Craving something more healthy? Opt for a salad and soup...Boom's got that covered too. No breakfast / brunch is complete without a cup of steaming hot coffee, right? Boom has cappucinos, lattes, espressos, hot chocolates, alongside a variety of smoothies, fresh squeezed juice and even booze! (Note: booze is available only at the College and St. Clair location). Boom's plush booths, molded wood paneling and cool blue subway tiles give off a very pleasant and modern diner atmosphere. This is their College location. A good ol' cup of coffee for me. A nice selection of fresh fruits cut to bite-sized chunks on a bed of crunchy granola and yogurt. This was a very tasty start especially with a drizzle of sweet honey. Comes with toast (not pictured). Light, fluffy and not too sweet, I love how these blueberry pancakes had a slightly crispy edge to them. So delicious. We "upgraded" to maple syrup. I chose the sausage which was moist and tender, and no complaints with the toasts and sunny side up eggs. I must say the most standout item on the plate were the BOOM frites. Crispy on the outside and soft on the inside, these frites had great seasoning and flavour. They were so addictive! Hidden underneath the poached eggs were pieces of sliced chorizo which I thought were a great addition to the otherwise classic eggs benny. This was a tasty plate but I personally prefer a thicker and creamier hollandaise sauce.